It’s a good idea to perform your best when national final qualification is on the line, so why not set new personal bests in order to book your ticket to the NCAA finals in Eugene, Ore.? Well, Saturday’s theme was “new all-time bests” for HepsNation athletes as three new conference records were set – all of them done by Harvard athletes – while other athletes greatly improved upon their initial seedings or personal bests to make the cut for Eugene. At the end of the three day competition, 26 members of HepsNation have qualified for the NCAA finals in Eugene, Ore.
Nikki Okwelogu will contest the discus-shot put double in Oregon as she unleashed a monster throw on her first attempt in the shot put qualification, setting a new personal best of almost 2 feet – 58-09 1/4. This mark ended up being the best in the entire competition as she was the third Ivy Leaguer to claim an East Preliminary Round title this week. Both the 4×100 and 4×400 relay conference marks were reset today as both teams will be off to Oregon. Gabrielle Thomas, Autumne Franklin, and Jade Miller were members of both of those relay teams. In the 4×100, Ngozi Musa handed off to Thomas, and then Franklin and finally Miller to get the baton around the track in 44.29 to finish fourth in their heat, outside of automatic qualification. After the completion of all qualifying heats, this quartet will advance as one of the time qualifiers. At the end of the night, Thomas handed the baton to Franklin, who then gave it to a fresh Christi Scott and then Miller anchored it home to finish third in their heat, automatically qualifying for the semi-finals in Eugene. This quartet was the first Ivy women foursome to ever go sub-3:30 in the 4×400 relay as they ran 3:29.98 (splits 52.3, 51.2, 54.2, 52.2 according to Coach Jason Saretsky). Like her teammates Franklin and Miller, Thomas will also be running as an individual in Eugene as she won her 200m quarterfinal heat in a wind-aided 22.37 (the fastest wind-aided time in conference history and a new all-conditions best for Thomas). This was the second fastest mark in the competition. Brown’s O’Sha Williams also used the wind to help her out in the competition. She was in the third flight of the triple jump where with a little help of the wind, Williams hop-skipped-jumped to a new all-conditions best distance of 43-01 3/4 that was the third best distance of the qualification at that time (also the third-best wind-aided jump in Heps history). With one more flight to go, she had to wait and see if her mark would end up being among the 12 best of the qualification to advance to Oregon. Luck was on her side as her mark held on as the 10th best in the competition and Williams will go to Oregon. Max Hairston ran a new all-time best in his 110m hurdle quarterfinal race, setting a new wind-aided conference record in the process. The Cornell senior ran 13.62 – a time that was good enough to advance once all of the quarterfinal races were completed. It was the 11th fastest time of the night. 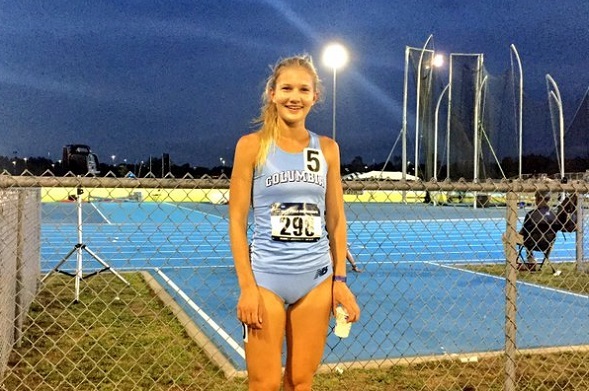 Columbia junior Natalie Tanner could not really use the wind like the sprinters or jumpers could in her 5,000m race, but that does not mean she could not go out there and set a new personal best. What helped her was that her heat ended up being the fast heat which pulled her along as the race progressed. In the end, Tanner ran a 69 second final 400m to break into the top 5, securing herself an automatic berth to Oregon while running an 11 second new personal best time of 16:12.04. Bobby Plummer of Cornell snuck into the final qualification spot in the men’s triple jump without needing any help from the wind. Plummer was in the final flight and finished 12th overall with a distance of 51-10 1/2 – 1 1/2 inches ahead of the first man out. Dartmouth’s Dana Giordano will be returning to Eugene as she finished the women’s 1,500m with the eighth fastest time of the night. She actually advanced by finishing second in her heat in 4:19.24 (0.02 seconds away from winning the heat) and securing an automatic berth in the process. Last year, Giordano ran the 5,000m in Eugene. Meanwhile, Yale’s James Randon and Cornell’s James Gowans will be going to Eugene for the first time as they both finished in the top 5 of their respective heats to secure automatic berths. Randon was the final auto qualifier in his heat as he was fifth in 3:47.01. Gowans was in the fast heat where he stayed near the front of the pack through the first half of the race. He held on to finish fourth in the heat with a time of 3:43.91. The final individual qualifier of the night was Penn’s Thomas Awad as he will be seeking redemption in Eugene. Last year, Awad did not finish the NCAA 5,000m final race. But Awad is likely wanting to end his collegiate career with an All-American honor. He finished fourth in his heat tonight in a comfortable 14:10.33 – earning an automatic berth – and finishing seventh overall in the competition. Update – now that the dust has settled, we have found a few more qualifiers among the results from both the East and West Preliminary Round. Princeton alumna Jasmine Blocker set two new personal bests en route to qualifying to Eugene in the 400m. Now representing Tulane, Blocker ran 52.39 in the First Round, followed by 52.25 in the quarterfinals. She earned an automatic berth by finishing third in her quarterfinal heat, and her time was the eighth fastest in qualification. Out in the West Region, Danielle Barbian ran the lead-off leg for the Oregon Ducks’ 4×100 relay that finished with the second fastest time of the meet – 43.75. This entry was posted on Saturday, May 28th, 2016 at 9:17 pm. It is filed under Athletes, Spotlight. You can follow any responses to this entry through the RSS 2.0 feed.